By Kori ~ June 4th, 2012. Chateau Ste. Michelle is Washington Stateâ€™s founding winery with its roots dating back to the repeal of Prohibition. In 1976, Ste. Michelle built a French-style chateau in Woodinville, just northeast of Seattle. While all of Chateau Ste. Michelleâ€™s vineyards are located on the east side of the Cascade Mountains, all of their white wines are made in Woodinville. Their red wines are made at Canoe Ridge Estate in eastern Washington. Recently, we had the opportunity to taste several wines from Chateau Ste. Michelleâ€™s Ethos Reserve and Limited Release series in a blind samples tasting. The word Ethos means â€œcharacterâ€ in Greek, the â€œdistinctive spiritâ€ of a specific culture, movement, or philosophy. Head winemaker Bob Bertheau works to impart that distinctive spirit in the limited production Ethos Reserve wines which aim to showcase the best of the vintage. The Limited Release wines allow the winemaking team to experiment a bit. These small lots are initially available exclusively to members of their wine club, the Vintage Reserve Club. After 30 days, these limited releases are offered to the public at the Chateau Ste. Michelle wine shop in Woodinville and online. 2008 Chateau Ste. 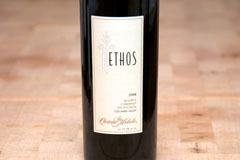 Michelle Ethos Reserve Cabernet Sauvignon (Columbia Valley, Washington): 94% Cabernet Sauvignon and 6% Syrah. Dark purplish red. Very aromatic with leather, earth, and a touch of creosote on the nose. Gorgeous black fruit and licorice come through on the palate. Full-bodied with crisp acidity and medium to high tannins. Well-balanced with a long, lingering finish. 2008 Chateau Ste. Michelle Limited Release Stone Tree Vineyard Syrah (Stone Tree Vineyard, Wahluke Slope, Washington): 100% Syrah. Dark purple in color. Nice nose with oak, black fruit, and black pepper aromas. Blackberry, black cherry, black pepper, and spice come through on the palate. Medium to full-bodied with crisp acidity and medium to high, dry tannins. Well-balanced with a very long finish. 2008 Chateau Ste. Michelle Limited Release Malbec (Wahluke Slope, Washington): 87% Malbec and 13% Cabernet Sauvignon. Dark, inky purple. Nice black fruit and a touch of earth on the nose. Fruit-forward with black cherry, earth, and spice on the palate. Medium-bodied with crisp acidity, medium tannins, and a long, smooth finish. 2010 Chateau Ste. Michelle Limited Release Viognier (Columbia Valley, Washington): 100% Viognier. Pale, greenish straw yellow. Very aromatic with floral and white peach aromas and flavors. Light to medium-bodied with lively acidity and a long finish. 2008 Chateau Ste. Michelle Limited Release Mourvedre (Columbia Valley, Washington): 93% Mourvedre and 7% Syrah. Dark red in color. Aromatic with smoked meat and barnyard notes on both the nose and palate. Medium-bodied with lively acidity, medium tannins, and a medium to long finish. It’s not often that many reviewers/bloggers pay attention to the limited release wines from Ste Michelle, so it’s great to see some notes about them. I’ve been a VRC member for about two years now and I’ve generally liked most everything I’ve received from them. The Ethos wines are almost always great, my only pet peeve is the use of Syrah in a lot of them, especially the Cab and the Merlot. The more recent vintages have seen less Syrah blended in, so that’s a move in the right direction in my book. 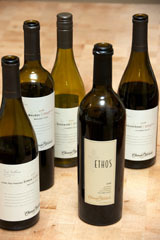 The Ethos Chardonnay has been a favorite of mine for some time now. It’s a shame you didn’t get to try it as part of this sampling, but if you haven’t already tried it, I highly recommend it. They also have “Druthers” which is their high end Cabernet Sauvignon that Josh Maloney did while he was there. The 2008 ranks right up there with some of the best Cabs I’ve had from Washington, and while the 2009 Druthers is a slightly different beast, it’s still a powerhouse. Overall great wines at great prices. Thanks for your kind words and for sharing your thoughts on the Limited Release and Ethos wines. It’s great to hear from a VRC member who has access to these wines on a regular basis. Cheers! I recently opened a 2007 Ste. Michelle Syrah. Have tried it several times in the last couple of years. I don’t get to taste a lot of American wines as I live in Europe, but this is really a suberb wine that I would give a 5 on your “bang for buck ” scale. I also think it’s a fine example of an affordable wine that can be fun for wine tasters that want taste results of bottle aging in a shorter period of time. The tannins of the wine have in my opion evolved, while the freshness and fruit concentration remain structured. Juicy without being jammy. Mmm. Thanks for sharing your thoughts on the 07 CSM Syrah. You are absolutely right; it delivers serious bang for your buck! In fact, I wrote about that wine in a previous post: http://winepeeps.com/2010/12/09/a-wine-for-tonight-2007-chateau-ste-michelle-syrah/. Cheers!